Brazil’s World Cup stadium will cost $900 million in public funds due to allegedly fraudulent billing, the Associated Press reports. The cost of the stadium has tripled, making it the world’s second-most expensive soccer stadium. 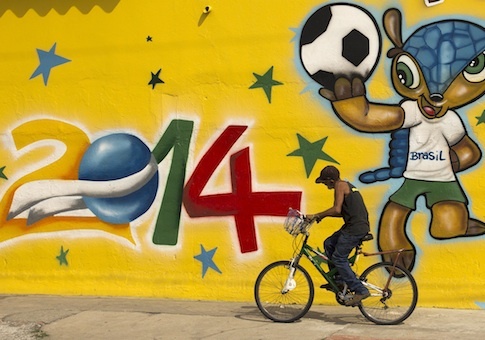 The cost for the entire World Cup project is $11.5 billion. [A]n Associated Press analysis of data from Brazil's top electoral court shows skyrocketing campaign contributions by the very companies involved in the most Cup projects. The lead builder of Brasilia's stadium increased its political donations 500-fold in the most recent election. The financial links between construction firms and politicians add to deep suspicions among Brazilians that preparations for soccer's premier event beginning next month are tainted by corruption, raising questions about how politicians who benefit from construction firms' largesse can be effective watchdogs over billion-dollar World Cup contracts. Anger over perceived corruption helped fuel huge protests last year, and there are fears more unrest could mar the Cup. "These donations are making corruption in this country even worse and making it increasingly difficult to fight," said Renato Rainha, an arbiter at Brasilia's Audit Court, which is investigating the spending on Brasilia's stadium. "These politicians are working for those who financed campaigns." In a 140-page report on the stadium, the auditors found $275 million in alleged price-gouging – and they have only examined three-fourths of the project. They forecast that fully one-third of the stadium's cost may be attributable to overpricing, the largest single chunk of $500 million in suspect spending auditors have flagged in World Cup construction projects so far. The AP analysis found multiple instances of materials that were double listed. It also discovered numerous cases of over billing. A poll taken last year found that three-fourths of respondents believed corruption is widespread in the World Cup construction. This entry was posted in Issues and tagged Corruption. Bookmark the permalink.